PRIOR TO FLORIDA: Helped Wyomissing High to its first Class AA state championship in 2012, finishing 16-0, a school single-season record for wins…Selected to the 2013 Under Armour All-American Game…Finished his senior year with over 1,000 rushing yards and 30 touchdowns from the fullback position and registered more than 100 tackles…Earned a spot on the 247Sports Class of 2013 All-America team…Named senior Class AA Player of the Year as part of the 2012 Pennsylvania Sports Writers All-State Team…As a junior, was named first team all-state, all-region and all-county…In 2011, ran for over 900 yards and scored 13 touchdowns and was named to the all-state team…Invited to “The Opening”, an all-star summer prospect camp held on the Nike Campus…Chose Florida over Notre Dame, Ohio State, Penn State, USC, UCLA, Miami, Tennessee, Pitt, Stanford, Georgia and Florida State…Coached by Bob Wolfrum. PRIOR TO FLORIDA: Played in all 10 games during the 2012 season at EMCC, tallying 26 tackles (12 unassisted) with 4.0 TFL (12 yards), 3.0 sacks, two quarterback hurries and one forced fumble…EMCC finished 8-2 on the year and ranked 15th in the final NJCAA poll…Anchored a defense that allowed just 74.2 rushing yards per game…Notched a season-high four tackles twice during the season, against Pearl River CC and Itawamba CC…Played under head coach Buddy Stephens at EMCC…Spent two years at Florida State before transferring to EMCC…Played in three games as a true freshman and two games as a sophomore before suffering an injury that caused him to miss most of the 2011 season…Totaled seven tackles in five career games at FSU…Missed the spring of 2012 at FSU after arthroscopic knee surgery and then transferred to EMCC in the summer of 2012…Entered his senior year of high school with 159 tackles, including 22 for loss and 15 sacks…Was the first commit in FSU’s 2010 signing class…Was a Florida Super 75 selection by the Times-Union…Named to SunStateFootball.com all-state first team in 2009…Attended the same high school as former Gator football players LB Wilber Marshall, WR Cris Collinsworth and TE Aaron Walker…Chose Florida over offers from Ole Miss, Texas A&M, Mississippi State and Arkansas. PRIOR TO FLORIDA: Could play both end and tackle…Named the 12th best defensive lineman at the Rivals/VTO camp in May…Had eight sacks and forced two fumbles as a junior for the Pirates…He earned first-team honors from the Sunshine Athletic Conference…Chose UF over offers from 23 other schools, including Florida State, Miami and Tennessee. Coached by Tom McHugh. PRIOR TO FLORIDA: Led First Coast to a 10-1 record in 2012…According to MaxPreps, totaled 97 tackles (67 solo), 2.0 sacks, 3 interceptions and 2 fumble recoveries as a senior…Recorded 12 sacks, nine forced fumbles during his junior year…Led First Coast to a 13-1 season and berth in the Class 7A state championship game in 2011…Participated in the U.S. Army All-American Bowl… Chose Florida over Alabama, Clemson, Florida State and many others…Coached by Marty Lee. PRIOR TO FLORIDA: Spent a year at Nebraska beginning in the fall of 2011 before attending St. Petersburg Community College for the fall of 2012…While at Nebraska, Moore started the first four games of the 2011 season and played in nine games overall…With him in the lineup, Nebraska totaled more than 200 yards rushing in all four games that he started, including 300-plus yard outputs against Washington and Wyoming…Was just the 10th true freshman offensive lineman to see action for Nebraska since 1973…His four starts for the Cornhuskers was the most by a true freshman offensive lineman in school history and made him the first true freshman offensive lineman to start a season opener…Named to the All-Big Ten Freshman Team by ESPN.com in 2011…While at Countryside HS, Moore was regarded as one of the top offensive line prospects in the country after helping his team to a 12-1 record in 2010, and a trip to the regional finals…Helped a Cougar offense rush for better than 2,900 yards and 45 rushing touchdowns in his senior campaign…As a junior, helped Countryside to an 11-2 record and the offense to a 225 rushing yards per game average…Chosen as a Class 5A all-state pick during junior season…Was a three-year starter for Countryside…Following senior year of high school, Moore played for the East team in the U.S. Army All-Star Game in San Antonio…Father, Brian, played tight end for Nebraska in the mid-1980s…Cousin, Jay Moore, was a three-year letterman (2004-06) playing defensive end at Nebraska…From the same high school as former Gator offensive lineman Jeff Mitchell and defensive lineman Clint Mitchell. PRIOR TO FLORIDA: Led his team to the quarterfinals of the 2012 GHSA Class AAA State Football Championship…Named the 2012 Class AAA All-State Team…Played in the U.S. Army All-American Bowl…Had more than 1,000 yards receiving on 53 receptions as a senior…Scored 15 touchdowns in his final high school season…Named the top wide receiver at the Atlanta MVP Camp…Grew up rooting for the Gators…Nephew of former NFL wide receiver Marcus Robinson, who played for the Chicago Bears, Baltimore Ravens and Minnesota Vikings…Chose Florida over Clemson and South Carolina…Also played basketball in high school…Coached by Chad Campbell. PRIOR TO FLORIDA: Selected to the 2013 Under Armour All-American Game…Was a first-team all-state selection by the Associated Press as a junior and first-team all-region as well as first-team all-district…Selected to the all-metro team by the Washington Post during his junior year and given the defensive MVP of his team in the same season…Invited to “The Opening”, all-star summer prospect camp held on the Nike Campus…Was part of a Briar Woods team that went 15-0 during senior year and claimed the state title…Notched 43 tackles (23 solo stops), with one sack in 2012 before suffering a season-ending injury…Chose Florida over South Carolina, Florida State, Georgia, Miami, Michigan, Duke, Clemson, Ohio State and Notre Dame…Coached by Charlie Pierce. PRIOR TO FLORIDA: Ran for 2,423 yards and 41 touchdowns as a senior…Surpassed NFL Hall of Famer Emmitt Smith as the state of Florida’s all-time leading rusher as a junior…In his high school career, totaled 12,121 yards and 191 touchdowns…Ended his junior campaign with 3,152 yards and 42 TDs…Was voted Player of the Year and received the Florida Dairy Farmers Class 2A Player of the Year Award…Named to the Florida Class 2A All-State First Team as a junior and senior…Under Armour All American…Was named the 2012 Lou Groza High School Player of the Year…Earned a spot on the 247Sports Class of 2013 All-America team…His father also won the award, making them the first father-son duo to do so…Invited to “The Opening”, an all-star summer prospect camp held on the Nike Campus…Played on the varsity team as an 8th grader and had over 1,500 yards and scored 28 touchdowns…Son of former NFL and Florida running back Fred Taylor…His father played with the father of fellow signee, Marcell Harris, at the University of Florida…Coached by Pete Walker. PRIOR TO FLORIDA: Caught 40 passes for 658 yards and nine touchdowns as a senior…In the state championship game against Central, Bailey threw two touchdown passes and caught one in the 40-31 victory…All-State selection as a junior…Invited to “The Opening”, an all-star summer prospect camp held on the Nike Campus…Playing in the 2013 Under Armour All-America Game at Tropiciana Field in St. Petersburg, Fla.…Went to the same high school as current Gator running back Matt Jones…Coached by Sean Callahan. PRIOR TO FLORIDA: Two-time all area and all-state selection…Had 73 tackles and seven tackles for loss in his final high school season…Totaled 74 tackles, seven tackles for loss, and two sacks as a junior…In his high school career, totaled 176 tackles, 15 tackles-for-loss, 3 sacks and one fumble recovery…Was just the second player in West Centennial school history to play varsity football as a freshman…Coached by Rob Parker. PRIOR TO FLORIDA: Named the top 2013 defensive tackle at the Rivals 100 Five-Star Challenge…Competed in the Orlando Nike Football Training Camp and The Opening…Played in the Under Armour All-American Game in January…Recorded 94 tackles, 5 sacks, 4 forced fumbles and 2 fumble recoveries as a senior…Named to the Florida Class 1A All-State First Team in 2012…Chose Florida over Alabama, Auburn, Cal, Florida State, Miami, Ole Miss, Purdue, South Florida, Tennessee, and Southern Cal…Coached by Alvin Carter. PRIOR TO FLORIDA: Spent two years at Georgia Military College after graduating high school from Westover in 2011…Was named a second-team NJCAA Football All-American in 2012…At GMC in 2012, Brown was part of a team that went 7-4 and averaged 188 yards rushing per game…Played under head coach Bert Williams at GMC…Brother, Reggie Brown, Jr., plays basketball at Fresno Pacific…Chose Florida over offers from Arizona, Arkansas, Florida State, Georgia, Houston, Kansas, LSU, Middle Tennessee State, Oklahoma, Ole Miss, Mississippi State, USF, Texas A&M, Texas Tech. PRIOR TO FLORIDA: Named to the AP Michigan Division 1-2 All-State Prep Team in 2012…Selected to the 2011 Michigan AP Division 1 All-State First Team, The Detroit Free Press All-State Dream Team, The Detroit News All-Metro West First Team, The Detroit Free Press All-West First Team, All Observer First Team, and KLAA All League in 2011…No. 259 prospect in the nation…Coached by Tim Baechler. PRIOR TO FLORIDA: Totaled 42 catches for 680 yards (16.2 avg) and 12 touchdowns as a senior…Participated in the U.S. Army Combine and The Opening…Big-size receiver who had 46 catches, 22 TDs, 1,141 yards as a junior…Chose Gators over Alabama, Clemson and Georgia…Coached by Mark Thorson. PRIOR TO FLORIDA: Totaled 110 tackles, 5 interceptions, 5 forced fumbles and 5 pass breakups as a senior…Also scored five touchdowns and five two-point conversions and averaged 34 yards per kickoff return…Named All-Western Conference, All-Hillsborough, All-Suncoast, All-State, Class 8A Defensive Player of the Year and the Guy Toph Award winner as Hillsborough County’s top senior football player…Finalist for the 2012 Florida Dairy Farmers Mr. Football Award…Named the Tampa Bay Times All-Hillsborough Defensive Player of the Year and a USA Today First Team All-American…Named the MVP of the Under Armour All-America game after a team-high 5 tackles, one interception and a pass breakup…Competed on the Southeast team at Champion Gridiron Kings where he had six interceptions and earned Defensive MVP honors…Earned a spot on the 247Sports Class of 2013 All-America team…Named the Tampa Bay Times Blue Chipper of the Year…Competed in the Sling-n-Shoot 7-on-7 tournament at USF…Defensive MVP from the IMG Madden 7-on-7 National Championship…As a junior in 2011, had 49 tackles and 2 interceptions, along with 11 offensive touchdowns…As a sophomore in 2010, had 44 tackles, 2 sacks and 2 interceptions…Chose Gators over an estimated 50 offers including Clemson, Vanderbilt, Miami and Notre Dame…His father, Vernon Hargreaves Jr., is the defensive ends and special teams coach at USF and his older sister, Carina, is on the club competitive cheerleading squad at UF…Vernon Jr. was named a member of UConn’s 100th Anniversary Team, commemorating the best football players in the programs first 100 years…Coached by David Mitchell. PRIOR TO FLORIDA: Selected to the 2013 Under Armour All-American Game…In just eight games during his senior season, tallied 52 tackles and eight pass breakups…Participated in “The Opening”, an all-star summer prospect camp held on the Nike Campus, as well as Gridiron Kings…His father, Mike Harris, was a Florida defensive back between 1994 and 1997…Chose Florida over Texas, Florida State, Oklahoma, Auburn, Miami, South Carolina, N.C. State, Notre Dame and LSU…Coached by Rodney Wells. PRIOR TO FLORIDA: Attended MVP Camp in Hampton, Ga…Recorded a 4.53-second 40-yard dash…Had 31 catches, 635 yards and five touchdowns as a junior…Picked Florida over Clemson among 15 offers, which also included Tennessee, Southern Cal, and North Carolina. 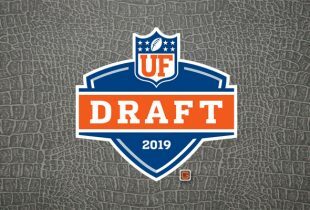 PRIOR TO FLORIDA: Has recorded a 31-inch vertical jump, he has a 9-foot, 4-inch broad jump and he runs a 4.95 forty-yard dash…Ranked as the No. 30 OG in the country by ESPN…Chose Florida over Vanderbilt and South Florida…Also played basketball in high school…Coached by Rush Propst. PRIOR TO FLORIDA: Played in the Under Armour All-America Game at Tropicana Field in St. Petersburg, Fla.…Selected Florida over Florida State and West Virginia…Coached by Stacy Sizemore. PRIOR TO FLORIDA: Attended the Tampa Combine…Ran for 1,000 yards on just 80 carries (12.5 yards per carry) as a sophomore…Missed his junior season because of an ankle injury… Nicknamed “Night Time”…Chose Florida over Alabama, South Florida, Rutgers, South Carolina and Florida State…Coached by Charlie Tate. PRIOR TO FLORIDA: All-State selection as a junior…Invited to “The Opening”, an all-star summer prospect camp held on the Nike Campus…As a junior, Neal had 151 tackles (68 solo, 83 assists), four interceptions, one of which he returned 20 yards for a touchdown, as well as four forced fumbles, five pass deflections and one offensive touchdown as a goal-line fullback… Picked the Gators over offers from UCF, USF, Duke, Georgia Tech, Kentucky and South Carolina…Coached by Inman Sherman. PRIOR TO FLORIDA: Recorded 34 tackles, four tackles for loss, and one sack in 2012 at East Mississippi Community College…EMCC finished 8-2 on the year and ranked 15th in the final NJCAA poll…Part of a defense that allowed just 74.2 rushing yards per game…Played with fellow signee Darious Cummings and the same school as current Gator Damien Jacobs…Coached by Buddy Stephens. PRIOR TO FLORIDA: As a junior, he had 53 tackles and 6 sacks…Chose Florida over offers from Alabama, Georgia, Clemson, Louisville and Michigan State among others… Coached by Andy Dyer. PRIOR TO FLORIDA: Invited to The Opening, an all-star summer prospect camp held on the Nike Campus…Invited to play in the U.S. Army All-American Bowl Game…Chose Gators over FSU, Notre Dame, Stanford among others…Close friends with Gator commit Vernon Hargreaves III…Coached by Earl Garcia. PRIOR TO FLORIDA: In 2012, passed for 1,715 yards with four touchdowns and rushed for 265 yards with 6 touchdowns…Threw for 1,872 yards and 19 touchdowns as a junior…Placed 3rd during competition drills at the Tulsa Power Camp…Selected UF over Memphis and Louisville…Coached by Cody White. PRIOR TO FLORIDA: Has recorded a 4.37 40-yard dash…First Team All-Area WR by The Gainesville Sun…Helped Gainesville to a 14-1 record and berth in the Class 6A state title game in 2012…Reached the Regional Finals in 2011 after a 12-3 record…GHS had a 47-9 record in his four years…Had 26 catches for 489 yards and 4 TDs as a sophomore…Was a Gainesville Sun first-team all-area selection in track & field…Coached by James Thomson. PRIOR TO FLORIDA: Has recorded a 4.48 40-yard dash…He was named a Times-Union All-First Coast first-team selection after scoring 11 touchdowns and intercepting two passes last season for the Conquerors…Has been starting at safety for the Conquerors since he was in the 8th grade…He chose UF over Florida State, Alabama, Auburn and Clemson…Coached by Verlon Dorminey. Now let hope they stay out of trouble,produce,and can stand competion. Go Gators. Im excited about Marcell Harris…. Will Max Staver be redshirted his Freshman year, and how do you see the QB order shaping up next year? Still seems like this is our biggest question mark on this team…?! Probably, yes. Murphy as back-up then Skyler or swap them.